As a government contractor for federal, state and local government agencies, Precision Office Furniture Installation is here to meet all of your facility services needs. We offer a full range of government contract services and work under the guidelines set forward by federal and state government agencies. 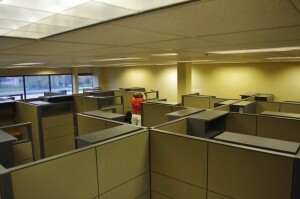 Whether your government agency is planning a major upgrade to your offices, you are downsizing your office, or you are relocating, Precision Office Furniture Installation is an approved Prime Contractor for all of your facilities management needs. Our team includes experienced project managers, professional designers, and POI Certified installers so that your specific needs can be met. We are an approved government contract services company so that you know we follow all federal guidelines for relocation services, installations, and reconfigurations. Precision is authorized to serve participating local governments and state agencies as well as federal agencies. We can handle all of your contractual work. Contact Precision Office Furniture Installation today for more information on efficient and affordable services for office furniture installation, reconfiguration or relocation.